This felt like the right book to begin 2019 with. I even held off finishing a book I was listening to just so that this could be my first finished book of the year. I'm weird like that. But I actually think Amy Krouse Rosenthal would approve of such a decision. I read her second memoir, Textbook Amy Krouse Rosenthal, a year and a half ago and have wanted to read this one, which was published twelve years before the other one, ever since. A lucky steal at my book club's Christmas book exchange let me take this book home with me. As a word of warning, I will say that if I hadn't already loved and enjoyed Amy Krouse Rosenthal's work in the past, I quite possibly might have put this book aside after just the first seven pages. That's because, before Amy launches into glimpses from her own life, she orients the reader to the world in 2004, sharing such things as common machines of the era, the current population, and popular ways to exercise. But she also shares "What We Call the Other Driver When We're Angry" and "What We Say When We Bang Our Knee on the Corner of the Table," and, spoiler, they weren't nice words. I might have thought, If this is the kind of content that's going to be in this book, then I'm through. But I had confidence in Amy and believed she wouldn't let me down, and she didn't, but I think in order to recommend the book, I'd advise skipping the "Orientation Almanac." As for the rest of the book, I loved it. As with Textbook, it has an unusual format that gives added clarity to things you wouldn't notice otherwise, in much the same way as poetry. 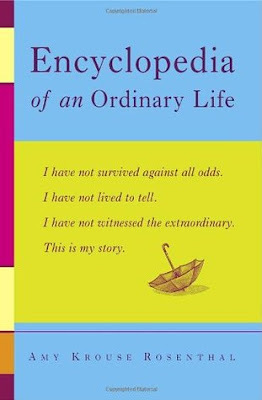 This one offers short entries, arranged alphabetically (not chronologically) to highlight the lovely ordinariness of a life well-lived and well-loved. Some might wonder if it really could be all that interesting to read about someone else's experience eating a radish or their opinion on smooth jazz, but it is, at least to me. And this is why: Amy has a way of bringing attention to things that you normally wouldn't think about and in doing so, an instant connection is made. (She searches for the best potato chip in the bag, too?! We could be best friends!!) I love that feeling of kinship, of realizing that something that I thought was just my own weird quirk is actually shared with someone else. For example, her entry on "Safire, William": "I look at William Safire's On Language column in the Sunday New York Times Magazine every week and think, I should read this, this is about the English language, this is relevant and smart and useful, and I do like words. And then I turn the page." This happens to me all the time. Not with William Safire; I don't even know who William Safire is. But with other things. I can't tell you how many times I've checked out a book or started following an Instagram account or subscribed to a podcast because it's something I feel should interest me, but then I can't get myself to actually read or listen to it. Sometimes I was the exact opposite of Amy, and I loved that too, such as the entry for "Parking Spot": "I would rather take the extra two minutes to maneuver into a tight and awkward parking spot that is a couple feet closer to my destination than take the big, wide-open spot a few cars down." In my case, I would much rather walk the extra two minutes and park free and clear of everyone else. A space with an open space on each side is like gold to me. I related to almost all of the passages on some level, whether it was because it resonated or contradicted with or amused me. I'm someone who loves to people watch, and that's basically what this is: seeing little snippets and then trying to fill in the gaps with what you already know. It's trying to find those connections while learning more about yourself in the process. I realized that this is essentially what I try to do each month with my This and That posts. I'm not attempting to give a day-by-day recounting of our month. I'm just giving a glimpse here and there of what went on with some random facts and observations thrown in for good measure. This book went along perfectly with my theme for 2019 to "Be Present." That is exactly what Amy does when she takes a step back and examines an otherwise ordinary event with new eyes and notices how she feels and celebrates the perfectness of it. I could relate to having almost identical thoughts to this passage: "I'm turning left. Look, everyone, my blinker is on, and I'm turning left. I am so happy to be alive, driving along, making a left turn. I'm serious. I am doing exactly what I want to be doing at this moment: existing on a Tuesday, going about my business, on my way somewhere, turning left. There is nothing disconcerting or unpleasant or unfortunate about this moment. It is exceptionally nice, plain, and perfect." But my favorite passage was possibly "Wabi-Sabi" because Amy captured a feeling I have felt many times before: that of being both simultaneously completely happy and completely sad. Until I read that entry, I hadn't ever thought to identify that feeling. I certainly never recognized it as a positive thing because to me, it feels uncomfortable to be happy and sad at the same time. But knowing that it's a legitimate feeling somehow makes it not only better, but actually kind of thrilling. I can't wait to feel it again but have a name for it this time. Is this the kind of book that would interest you? Do you like reading about someone else's quiet life? Or do you need something a little more exciting? Ohhh I will definitely have to read this, thank you for covering it here. I loved Textbook and really, that was my first encounter with AKR. She seems like she was such an interesting person. If you loved Textbook, then you'll love this one as well!